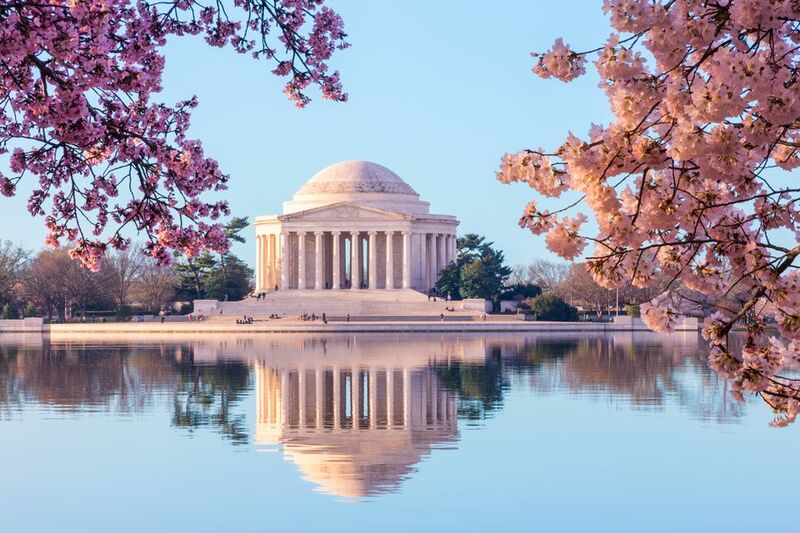 The historic buildings of Washington, DC preserve the past and offer a fascinating glimpse into the changes in architecture and daily American life since the early settlement of the nation's capital. Here is a guide to the 25 oldest and most significant Washington, DC historic landmarks, in order of date of construction. Mount Vernon, Virginia. The 500-acre estate of George Washington and his family includes a 14-room mansion that is beautifully restored and furnished with original objects dating back to the 1740's. Visitors can tour the outbuildings, including the kitchen, slave quarters, smokehouse, coach house, and stables. The historic site is located along the shores of the Potomac River and is the most scenic tourist attraction in the Washington, DC area. 3051 M St. NW Washington, DC. Located in the heart of Georgetown, the oldest known private home in Washington, DC is preserved to demonstrate everyday life for the average citizen during this time. The historic house is maintained by the National Park Service and is open to the public. E. Capitol St. and First St. NW Washington, DC. One of the most recognizable historic buildings in Washington, DC is the U. S. Capitol building. Since its original construction, the building has been built, burnt, rebuilt, expanded and restored. The Capitol Complex includes the Capitol Building itself, the House and Senate Office Buildings, the U.S. Botanic Garden, the Capitol Grounds, the Library of Congress buildings, the Supreme Court Building, the Capitol Power Plant, and various support facilities. 1600 Pennsylvania Ave. NW Washington, DC. Although construction of the White House began while George Washington was president, he never lived in it. President John Adams and his wife, Abigail, were the first residents of the White House. The important Washington, DC landmark serves as the President’s home and office. There are 132 rooms, 35 bathrooms, and 6 levels. 15 St. and Pennsylvania Ave. NW Washington, DC. The historic Gregorian-style building, located to the east of the White House, was burned and rebuilt several times during the 1800s. It is the third oldest federally occupied building in Washington DC, preceded only by the Capitol and the White House. At the time that it was built, it was one of the largest office buildings in the world. It is five stories tall and sits on 5 acres with a landscaped garden. 2715 Q St. NW Washington, DC. The historic house in Georgetown was originally the home to Joseph Nourse, first Register of the U.S. Treasury. Today it is owned by The National Society of the Colonial Dames of America and serves as a museum displaying an outstanding collection of Federal period (1790-1830) furniture, paintings, textiles, silver, and ceramics. 144 Constitution Ave. NE Washington, DC. The National Historic Landmark located on Capitol Hill is the headquarters of the National Woman's Party and was the home of its founder Alice Paul. The museum offers educational programming and is open for public tours. 1799 New York Ave. NW Washington, DC. This building was designed by Dr. William Thornton, the first architect of the U.S. Capitol. It was part of the Pierre L'Enfant plan to establish a residential section of the federal city. During the War of 1812, the Octagon served as a temporary home for James and Dolley Madison after the White House was burned. Later, the building served as a girls school, the Navy Hydrographic Office, and headquarters for the American Institute of Architects. Today, the historic building serves as a museum of architecture, design, historic preservation, and the early history of Washington, DC. Arlington National Cemetery, Arlington, VA. The home of Robert E. Lee and his family serves as a memorial to this important historical figure that helped restore America after the Civil War. About 200 acres of the land that occupies Arlington National Cemetery was originally the property of the Lee family. Arlington House sits atop a hill, providing one of the best views of Washington, DC. 1401 Pennsylvania Ave. Washington, DC. The historic luxury hotel has been a central gathering place for elegant dinners, meetings and gala social events for more than 150 years. The Willard is a Washington institution that has hosted almost every U.S. president since Franklin Pierce in 1853. 1644 31st St. NW Washington, DC. The federal era mansion was built by Martha Washington's granddaughter, Martha Custis Peter and was the home to six generations of the Peter family. Today, the historic home offers house tours, garden tours, and special events. 748 Jackson Pl. Washington, DC. Located just steps from the White House, one of the oldest homes in Washington, DC features Federalist and Victorian style furnishings and exhibits that explore 200 years of Washington, DC history. 517 10th St NW Washington, DC. The historic Ford's Theatre, where Lincoln was assassinated by John Wilkes Booth, is a national historic landmark and also functions as a live theater. The building was used for several different purposes until it was restored in 1968. The Peterson House, the rowhome where Lincoln died, sits across the street. It is open to the public and is furnished with period pieces of that time. 750 9th St. NW, Washington, DC. The U.S. Patent Building was restored as a vital part of the redevelopment of the Penn Quarter neighborhood of downtown Washington, DC. The building houses two museums in one building. The National Portrait Gallery presents six permanent exhibitions of nearly 20,000 works ranges from paintings and sculpture to photographs and drawings. The Smithsonian American Art Museum is the home of the largest collection of American art in the world including more than 41,000 artworks, spanning more than three centuries. 1000 Jefferson Dr. SW Washington, DC. The Victorian style, red sandstone building was originally the home of the first Secretary of the Smithsonian, Joseph Henry, and his family. The building is the oldest one on the National Mall and it served as the first Smithsonian exhibit hall from 1858 until the 1960s. Today, it houses the Smithsonian’s administrative offices and the Smithsonian Information Center. 675 15th St. NW Washington, DC. The oldest saloon in Washington, DC, features upscale American cuisine in a Victorian setting. It is a popular gathering spot for politicians, congressional interns, journalists, and tourists. Pennsylvania Ave. and 17th St. NW Washington, DC. The French Second Empire style building was designed by architect James Renwick Jr. to house the private art collection of Washington banker and philanthropist William Wilson Corcoran. By 1897, Corcoran's collection had outgrown the building and the gallery was moved to its current location across the street. The U.S. Court of Claims took over the Renwick Building in 1899. In 1972, the Smithsonian restored the building to be used as a gallery of American art, crafts, and design. It was refurbished again in 2000. 7th St. & North Carolina Ave. SE Washington, DC. The historic market is one of the few public markets left in Washington, DC. A fire destroyed the market's original South Hall in 2007 and it is currently being restored. A temporary structure is being used across the street at the Hine Junior High School playground. The farmers market offers fresh produce and flowers, delicatessen, baked goods, meat, fish, poultry, cheese, and dairy products. On weekends, the Farmers Market moves outdoors. Arts & Crafts Fairs are held on Saturdays and The Flea Market attracts a crowd on Sundays. 1411 W St. SE Washington, DC. Frederick Douglass, the famous abolitionist, and advisor to Lincoln, bought this house in SE Washington, DC in 1877. The year that it was built is unknown. The National Historic Site was recently restored and reopened in 2007. The home and the grounds are open to the public. Reservations are required. 15th St. and Constitution Ave. NW Washington, DC. Construction of the Washington Monument began in 1848. However, the memorial was not completed until 1884, due to lack of funds during the Civil War. The monument honors the memory of President George Washington and is an important historic site and landmark on the National Mall in Washington, DC. 401 F St., NW Washington, DC. Housed in the former Pension Bureau building, this historic structure is recognized as a marvel of architectural engineering. The Great Hall is impressive with its Corinthian columns and ​a four-story atrium. The museum in downtown Washington, DC examines America's architecture, design, engineering, construction, and urban planning. 17th St and Pennsylvania Ave. NW Washington, DC. Located next to the West Wing, this building houses a majority of the offices for the White House staff. The impressive structure, a fine example of the French Second Empire style of architecture, was originally built for the State, War and Navy Departments. 500 17th St. NW Washington, DC. The historic building was established as a private art gallery to house the extensive collection of Washington banker and philanthropist, William Wilson Corcoran (partner of the bank Corcoran & Riggs). The Corcoran galleries are now closed as the building is undergoing renovations. 50 Massachusetts Ave. NE Washington, DC. The city's train station is a beautiful historic building with exquisite features such as 50 foot Constantine arches and white marble flooring. Union Station is a transportation hub for the region as well as an upscale shopping destination.